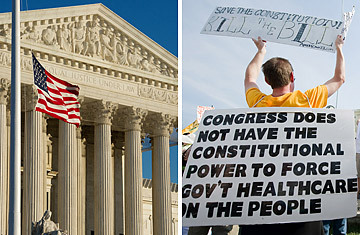 Health Reform: SCOTUS to Dial Back Federal Power? But in his opinion Monday, Vinson, too, cited the nation's early history  and appealed back beyond Marshall, perhaps the most powerful Chief Justice to serve, to an even more hallowed figure, James Madison, the Constitution's chief architect. Vinson spent dozens of pages discussing how he believes the early writings of Madison, especially in the Federalist, show that he and other founders intended to severely limit the power of the federal government and that of Congress. "This case is not about whether the Act is wise or unwise legislation, or whether it will solve or exacerbate the myriad problems in our health care system," he wrote in the opening pages of the decision. "In fact, it is not really about our health care system at all. It is principally about our federalist system, and it raises very important issues regarding the Constitutional role of the federal government. James Madison, the chief architect of our federalist system, once famously observed: 'If men were angels, no government would be necessary. If angels were to govern men, neither external nor internal controls on government would be necessary. In framing a government which is to be administered by men over men, the great difficulty lies in this: you must first enable the government to control the governed; and in the next place oblige it to control itself.'" Vinson later praised Rehnquist's Lopez decision, and said the tension in the health care case stems entirely from the debate over the "substantial effects" test that Thomas finds so objectionable. "If we entertain too expansive an understanding of 'effects,' the Constitution's enumeration of powers becomes meaningless and federal power becomes effectively limitless," Vinson wrote. "If we entertain too narrow an understanding, Congress is stripped of its enumerated power, reinforced by the Necessary and Proper Clause, to protect and control commerce among the several states." That's the question the new Chief Justice and his colleagues will have to answer, once this case reaches the high court. If the majority agrees with Vinson, President Obama would find not only his health care bill undone, but also face the most significant scaling back of the government's power to use legislation to solve its problems in decades. Now all sides have but one choice: to wait as these cases  and more than 20 others that according to Reuters have been filed across the country  make their way to the Supreme Court. How soon that will be is unclear, though at least two appeals courts have already announced they will expedite their reviews and scheduled arguments for May. For his part, Barnett, who was favorably cited by Vinson's opinion, said anything is possible. "It doesn't mean it can't be done now," he told the gathering of law professors. "The Supreme Court is perfectly capable of extending the powers of Congress." Whether it will or will not comes down to the same calculations court watchers are used to: Are there five votes?